It’s a Dark Maze ninjapocalypse! Apparently, Dark Maze Studios of Champaign can’t get enough of those stealth warriors from the East! Two brand-new home videos employ numerous ninjas armed with their most secretive weapon yet – humor – in the fight against corporate tyranny, dishonorable brethren, and horrible DJ mash-ups. 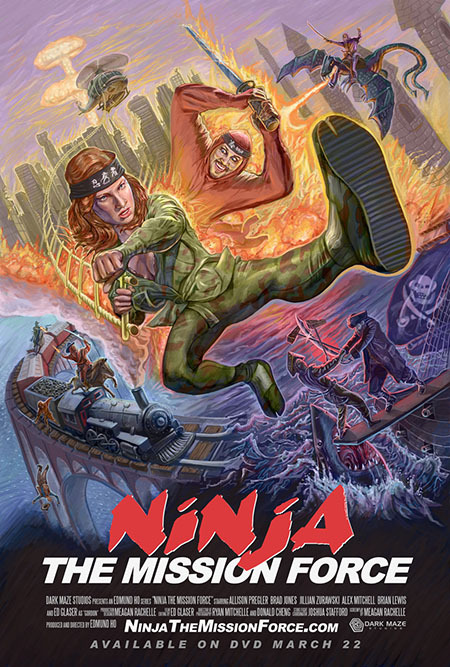 Just released to region-free DVD this past Friday, March 22, is the second full season of NINJA THE MISSION FORCE, Dark Maze’s comedy pastiche pitting in-house actors against public domain material in an all-out war of giddy silliness. Interpol agent Cheetah Lee (Allison Pregler) steps in for Master Ninja Gordon (Ed Glaser) as Evil Ninja Bruce (Brad Jones) is resurrected by lightning before renewing the ninja feud! Unlike the direct-to-Internet Season 1, you will have to purchase the disc to watch the entire sophomore series although the premiere episode is free to view on-line. In “Bruce Fights Back From the Grave,” Cheetah Lee must stop the spread of Bruce’s “weaponized Emo-Dub-Country music” with the help of diminutive informant Henry Hamster (voice of series creator-writer Meagan Rachelle) and stock footage from the Eighties television show THE MASTER starring Lee Van Cleef and Timothy Van Patten. The release includes all 10 episodes of Season 2, two commentary tracks, and something called “The Outlaw Script” which the producers could not produce “legally.” Hmmmmmmm. Also in this set is the unadulterated widescreen feature, NINJA THE PROTECTOR (1986), a cut-and-paste Godfrey Ho effort that directly inspired the MISSION FORCE concept. 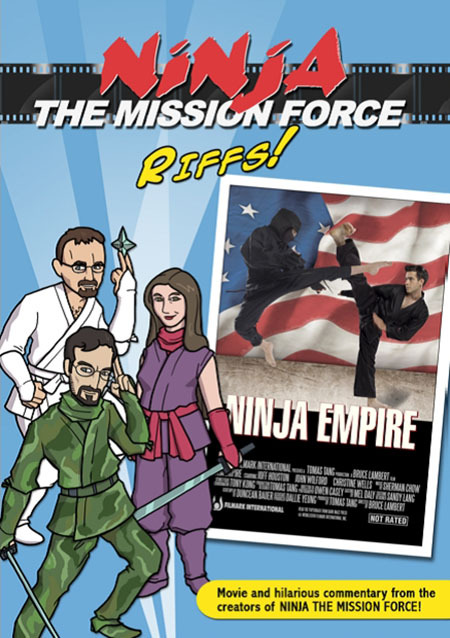 However, Dark Maze regulars Glaser, Rachelle, and Jones decided to give a less fortunate Ho joint the funny business on a separate DVD release, NINJA THE MISSION FORCE RIFFS!, released a few weeks earlier on Friday, February 8. In this exercise, the trio mix MISSION FORCE-style voice dubbing with interjected commentary on the soundtrack to NINJA EMPIRE (1987). “Bruce Fights Back From the Grave” also appears here as a bonus. This entry was posted on Tuesday, March 26th, 2013 at 3:00 pm	and is filed under Home Videos du C-U. You can follow any responses to this entry through the RSS 2.0 feed. Both comments and pings are currently closed.